ww2dbaseUS 6th Army Group under General Jacob Devers was tasked with moving into southern Germany to protect the right flank of operations further north and to prevent German troops in the Berlin area from moving southward into the Alps. The campaign began with US 7th Army, under Lieutenant General Alexander Patch, penetrating German lines south of Frankfurt, but meeting stiff resistance beyond. On 15 Apr, Dwight Eisenhower added George Patton's US 3rd Army to this campaign, ordering it to move southeast along the Danube River toward Austria. ww2dbaseAs Nürnberg (English: Nuremberg) became threatened, Nazi official Karl Holz was placed in command of the German defense at that city, which bore spiritual significance to the Nazi Party. Holz ordered the construction and deployment of additional anti-tank ditches, anti-aircraft batteries, and other defensive establishments mostly on the western side of the city, believing that, despite having only 7,000 troops, he could hold the city for an extended period of time. On 16 Apr, US 7th Army reached the northeastern outskirts of Nürnberg, surprising the German defenders who had focused on the west. The Americans captured the Erlenstegen and Buch neighborhood very quickly, followed by the rail marshaling yard and the airport. 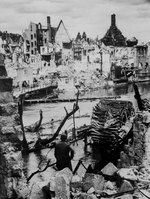 The assault on Nürnberg's old city began on 18 Apr; when the old city was taken two days later, the combination of fierce German resistance and the liberal use of US artillery resulted in the damage or destruction of many historical buildings, including the castle. Holz turned down four opportunities to surrender, and died in combat in a police station in the morning of 20 Apr; his deputy, Colonel Wolf, surrendered to the US 7th Army at 1100 hours. ww2dbaseThe city of München (English: Munich) was attacked by US 20th Armored Division, US 3rd Infantry Division, US 42nd Infantry Division, and US 45th Infantry Division. Although the German garrison at München were also stubborn in its defense, the city would fall under US control by the next day. ww2dbaseAfter the fall of these two major cities, and given the dire situation in Berlin, the morale in southern Germany crumbled. Many German units began to break up or surrender en masse. 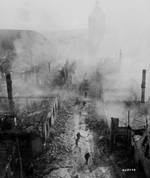 3 Apr 1945 US 45th Infantry Division captured Aschaffenburg, Germany. 5 Apr 1945 French First Army captured Karlsruhe, Germany. 8 Apr 1945 US Seventh Army captured Pforzheim in southwestern Germany. 11 Apr 1945 US Third Army captured Weimar, Germany and US Seventh Army reached Schweinfurt. 12 Apr 1945 In southwestern Germany, French troops captured Baden-Baden and US troops captured Heilbronn. 14 Apr 1945 In Germany, US Third Army captured Bayreuth and Gera. 15 Apr 1945 French First Army captured Kehl and Offenburg, Germany. On the same day, Dwight Eisenhower ordered US 3rd Army under George Patton and US 6th Army Group under Jacob Devers to make a thrust toward Austria. 16 Apr 1945 US troops reached the outskirts of Nürnberg, Germany. 17 Apr 1945 US troops captured the rail marshaling yard and airport of Nürnberg, Germany. 18 Apr 1945 US troops began fighting in the old city section of Nürnberg, Germany; meanwhile, US 3rd Army sent units across the Czechoslovakian border. 20 Apr 1945 US Seventh Army captured Nürnberg, Germany. 21 Apr 1945 French First Army captured Stuttgart, Germany. 22 Apr 1945 US Seventh Army established a bridgehead across the Danuber River in southern Germany, while US Third Army began moving south through the Danube Valley. To the west, French First Army reached the Swiss-German border. 24 Apr 1945 US Seventh Army crossed the Danube River to capture Ulm, Germany. Also in southern Germany, US 3rd Army reached the Danube River. 29 Apr 1945 US troops arrived at the outskirts of München, Germay. To the west, French First Army captured Freidrichshafen. 30 Apr 1945 US troops captured München, Germany. 50 kilometers to the northeast, at Moosburg, US Third Army freed over 100,000 prisoners of war. 3 May 1945 US Third Army crossed the Inn River in Germany. 4 May 1945 US Seventh Army occupied Innsbruck, Berchtesgaden, Germany and Salzburg, Austria. 5 May 1945 US Third Army captured Karlsbad and Pilsen in occupied Czechoslovakia. My father, Paul Wiland, was in the 3rd Army during WW2. He told many stories but didn’t know how to describe exact locations. At Dad’s funeral an older man told me my Dad was the first soldier in the 3rd army to enter Germany, but had sworn his friends to keep it secret because he wanted no honors. He told me Dad said “If anyone should be honored it should be the guys in front of me who didn’t make it.” Can you help me learn more about Dad, and whether this is true? Hi, I am an English guy living in a village south of Stuttgart..having been cycling through the forests here I visit a village called Dettenhausen...This village has a number of bunkers and the locals tell me that the American army was engaged in a battle for the village..How can I find out more about the involvement of the army in this area south of Stuttgart?